On an 1839 map of the town, the entrance on the left is marked as White (White's?) Lane1. I'm not sure why, but one possibility is that, at some stage, it led to Annebrook House2, the residence of Robert White who was listed under Gentry in Pigot's Directory of 1824. An 1855 map has 'Old Barrack Lane' marked here, and an estate map from 1895 (in the Local Studies section of the library in County Hall) names the area behind the Leinster Hotel as ‘Barrack Lot’. Did this barracks house the Baronial Police or its successor, the Peace Preservation Force? [See entry for No. 13 Market Square]. Or was it the predecessor of Maryborough Military Barracks (the Garda Station today) which opened in 1808? Any information gratefully received. In more recent times, the laneway led to County Tyrone native Daniel McAuliffe's coach-building workshop. (Note the original wheel-guards on either side of the carriage arch). He was clearly a man who tried to move with the times - his advertisement in 1916: Motor Cars painted and varnished. All work neatly and promptly executed - but the dominance of the motor car did put an end to the coachbuilding craft and McAuliffe's business eventually closed in the 1930's. In 1971, John McAuliffe, Daniel's grandson and son of Patrick and Ellen (née Furlong)3, returned from working in Canada. The following year, he established a light engineering firm here - Fire escapes to Order - and this continued into the early 1990's. In 1850 James Kinsella was leasing this house from William Brophy. He was succeeded by Eliza Whelan, Michael Delaney, Denis Bergin (1881) and, from at least 1887, Daniel McAuliffe. In 1901, he was was living in part of this house with his wife Bridget and their three young children, John, Patrick and Mary. They kept two boarders, John and Patrick Holohan, both described as labourers. Ten years later, his sons were also listed as coachbuilders. 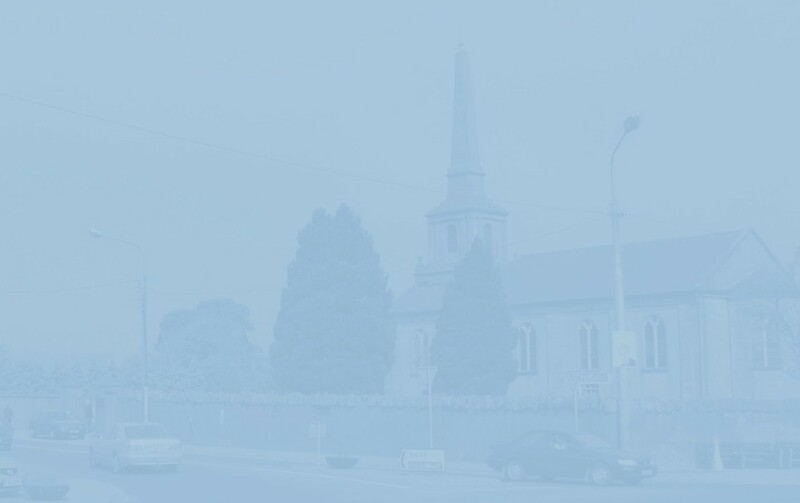 For Daniel and Bridget, life was not immune to great sadness; in 1912, their daughter Mary died aged only 22, followed six years later by her brother John, aged 33. The other portion of the premises was let to a succession of tenants; in the 1890's, William Clear, a butcher; and, in 1901, Johanna Clear, a grocer. (Her assistant was Elizabeth 'Lizzie' Fitzgerald who, as we've seen, later opened her own small shop beside Hume's). Next came Conroy's barber shop and, from 1946 to 1989, Nicholas 'Nixie' Croke's Betting Office (Best Market Prices Given). For a short time this was succeeded by a second-hand bookshop owned by John and Ann McAuliffe. 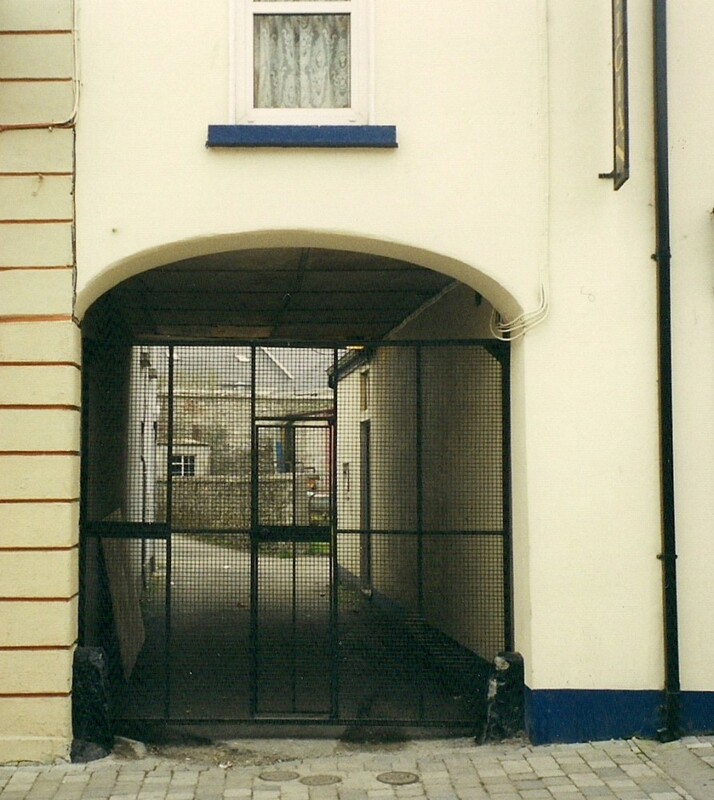 In 1993, Marian Carton (who had her first optician's shop further up Main Street) bought the McAuliffe house, but not the yard. Her brother Paul, incidentally, is a fine uileann piper, well known in local sessions. In 1850, the building that eventually housed Nu-Lyfe Dry Cleaners was leased by Peter Loughman from the above-mentioned William Brophy. He was succeeded, in the late 1870's, by William Walshe, a baker and father of Catherine, subsequent owner of the shop next door (see next page). According to one of my informants, this small building was subsumed into the larger one and used as a storeroom. 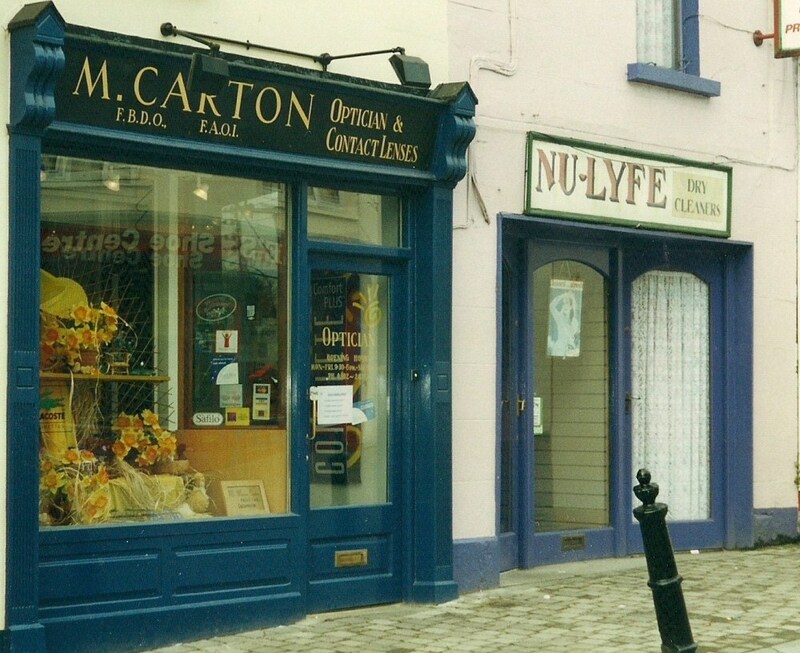 Nu-Lyfe Dry Cleaners opened for business in 1968 and was succeeded by Clean Jean Dry Cleaners. The latter closed in 2012 and, since then, the premises have been vacant. In the 1980's, Airs and Graces Hair Studio (The Midlands' Most prestigious Unisex Hair Studio) occupied the second floor: in December 1980, it proudly announced the arrival of - brace yourself, Bridie - our new stylist from Dublin, Gerri St. John Keane. 1 From the way it's printed, it's hard to decide whether the Post Office marked on the same map stood where Ramsbottom's or Carton's is today. 2 The big white house, facing JFL Avenue, near Rankin's Wood today. In the mid-19th century, it was part of The Midland Retreat, a private and, it appears, progressive asylum run by Dr John Jacob. Annebrook was "for the reception of ladies"; Woodville (Meelick) for gentlemen. In later years, it was the home of Patrick Joseph Meehan (1877-1929) MP, and, in the 1950's and '60's, the Delahunty family. The Rankin family live there today. 3 After Patrick's death, Ellen - known locally as Lena - eventually remarried and became Mrs Denis Downey.